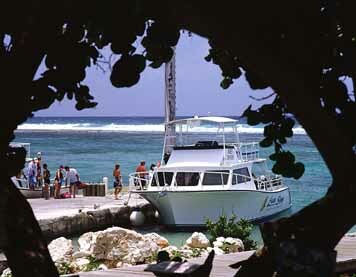 There is no bigger claim to fame than Cayman Brac's fame to diving. 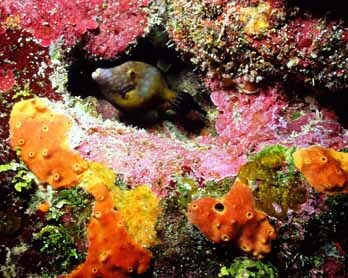 With approximately 50 different sites, there is no shortage of underwater amazement in the Brac. The Cayman Islands as a whole sport more than 200 dive sites in crystal clear waters with visibility often reaching 200 feet. Snorkellers can enjoy boat or shore excursions featuring a vast array of marine life, coral formations and wrecks. freely with humans in only three feet of water at the shallow Sandbar area. And in Stingray City you may dive with more than two dozen "tame" Atlantic Southern Stingrays that seem to enjoy the company of humans. services such as equipment repair, rentals and well-maintained, state-of-the-art dive boats are abundant on the Cayman Islands. A main attraction is the 330-foot Russian warship, M.V. Capt. Keith Tibbetts. This ship was renamed and scuttled in 1996 on the inside edge of the drop-off on the northwest coast of Cayman Brac. The warship enables divers to explore the missile launcher, machine gun turrets, fore and aft cannons and swim-through access of the bridge and upper decks. Marine life has moved right in and set up housekeeping. Escorted dive operations through the resorts enables divers to take on this challenge safely. For those that are not proficient at diving, and do not want to miss out on the fantastic array of underwater life around them, the Atlantis Submarine offers a variety of dives, day and night, to a depth of 100 feet. 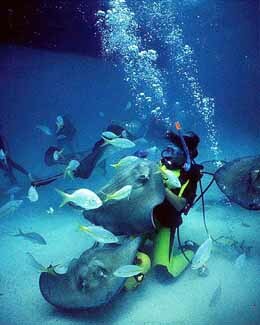 The Atlantis XI brings visitors up close and personal with the underwater world.